The tape measure has remained virtually unchanged for over 100 years until now. 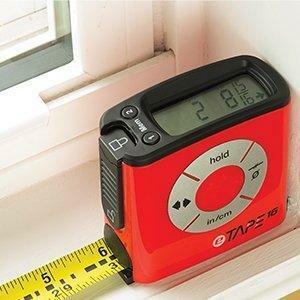 The eTape16 digital tape measure revolutionizes not only the tape measure but also expands its utility as never before envisioned. The large digital display provides easy reading while the advanced features are readily accessible. These features include 3 memories, US or metric units, centerline calculation, re-zero and Inside/Outside measurements. In addition to its advanced features, the eTape16 incorporates a sleek modern design. Made of polycarbonate plastic, the eTape16 is made to last in the most rugged of environments. 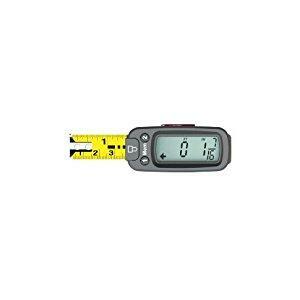 The large digital display provides an easy-to-use traditional measuring tape with digital readouts and functions. 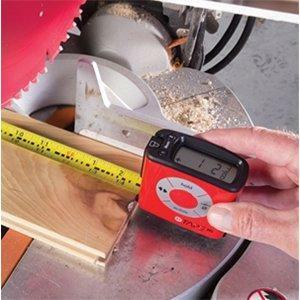 As you pull out the measuring tape blade, the measurement displays on screen for easy reading. To save simply tap a button. It also converts measurements quickly from fractions to decimals, or inches to centimeters and calculates midpoints (great for helping to hang a picture). And finally, no need to bend the tape when measuring into a corner, just select the back of the device as the starting point. Finally, the technology revolution makes an advanced tape measure a reality. With the eTape16, measuring is made more simple, reliable and accurate. 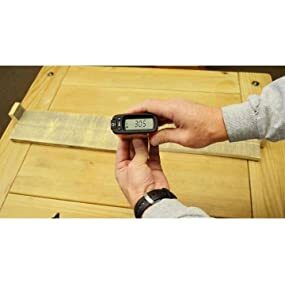 You will be amazed in the many ways you will utilize the eTape16 digital tape measure that was not possible with an ordinary tape measure. Be a part of the eTape16 revolution, 'Measure it, Read it, Record it! '.